Inspired by my foray into tagines and experiences with salads, I’ve been trying to incorporate pomegranates into cooking for quite some time. Well, I think I’ve finally found the answer. This dish is certainly very filling but perfect for a sunny day lunch in the garden. The key is balancing the seasoning – whilst the sweetness of the pomegranate helps, you need to make sure the filling is well seasoned or the entire experience is far too bland. You will also need a base of some kind. 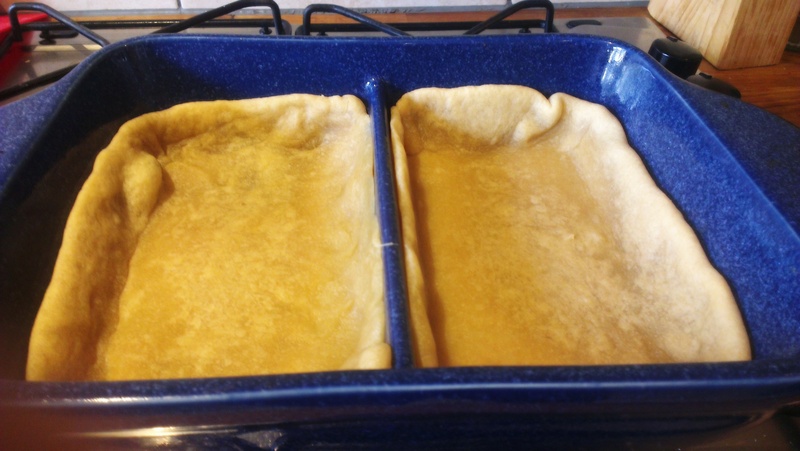 Either make your own short-crust or use a premade one, it doesn’t really matter. We used this very easy no-yeast, three ingredient pizza base. Grease your casserole dish. 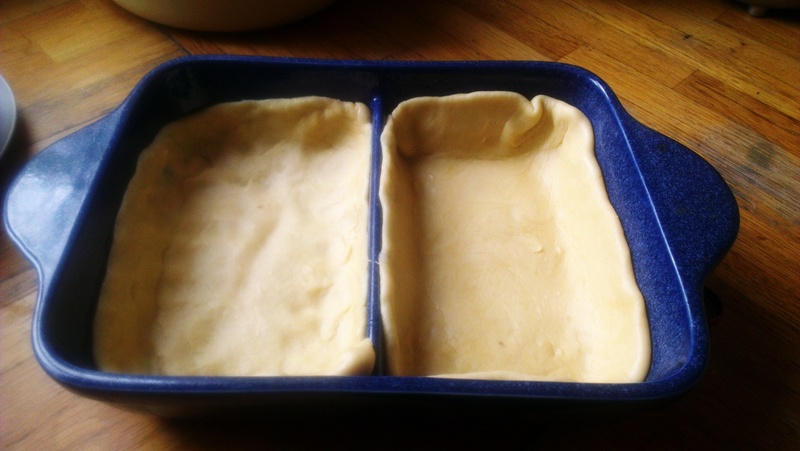 We used this handy-split one to make two tarts rather than one large one. By all means scale up or down. Form your base to fit the shape of your dish. Cook in the oven until fairly crisp. 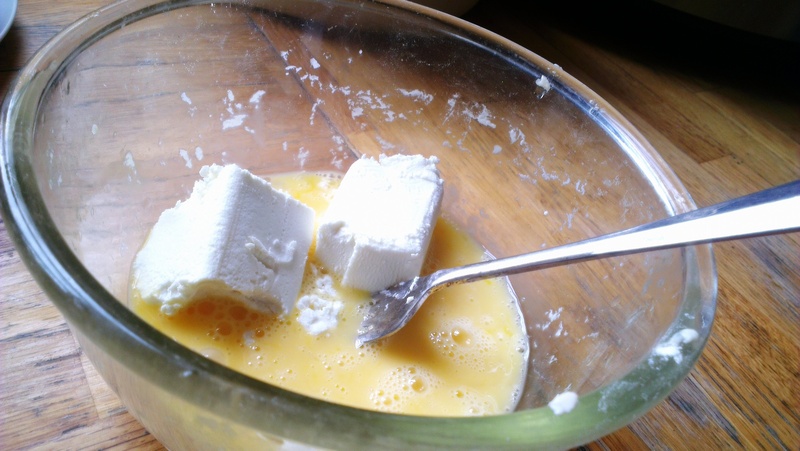 Whilst the base cooks, put the goats cheese into a bowl and combine with beaten egg. 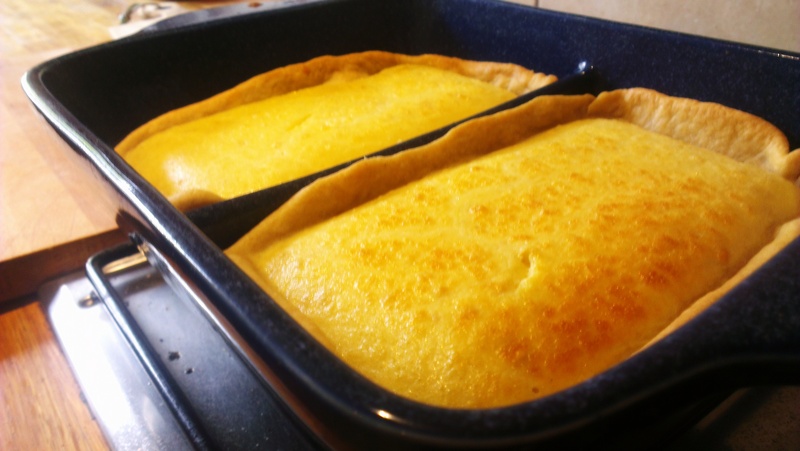 You’re not making a nice airy quiche – this is meant to be a fairly dense filling. Use your own judgement as to if you have enough cheese-egg mixture. We used 2 eggs for 125g Goats Cheese and a splash of milk just to give it more bulk. Just don’t loose the goats cheese flavour. Season well! 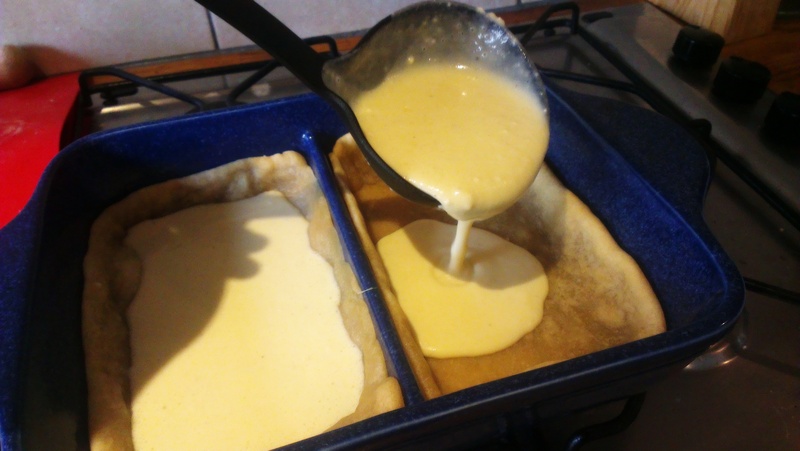 Pour into the crisp base casings and cook in the oven until a knife comes out cleanly and the the top is beginning to brown. 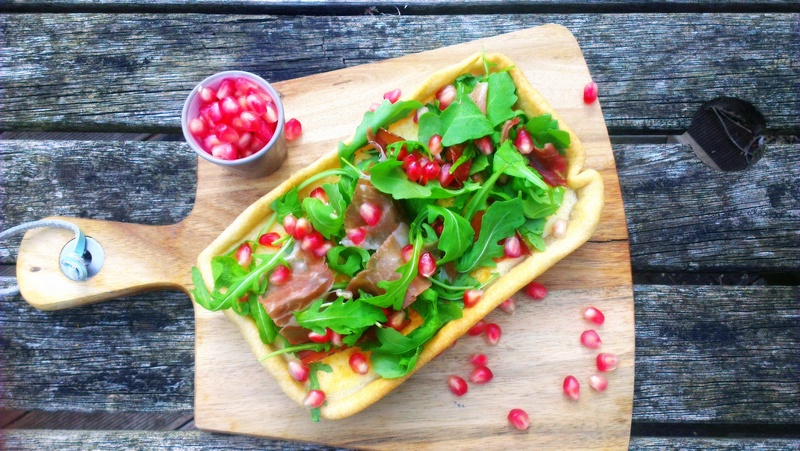 When cooked and ready to serve, scatter the top with prosciutto, rocket and pomegranate. Fresh pomegranate is such good value for money and much easier to prepare than you’d think. Follow these tips. This is good hot or cold, and as a main or a sharer. To share, slice into 1 inch thick pieces and dish out. Having a little pot of spare pomegranate seeds is always useful as well – they have a habit of falling off! This will keep well in the fridge for a day or two. Remember, store before completing the final step – only add the toppings just before serving. Cheese got your goat? Let us know how you feel about goats cheese in the comments section below. 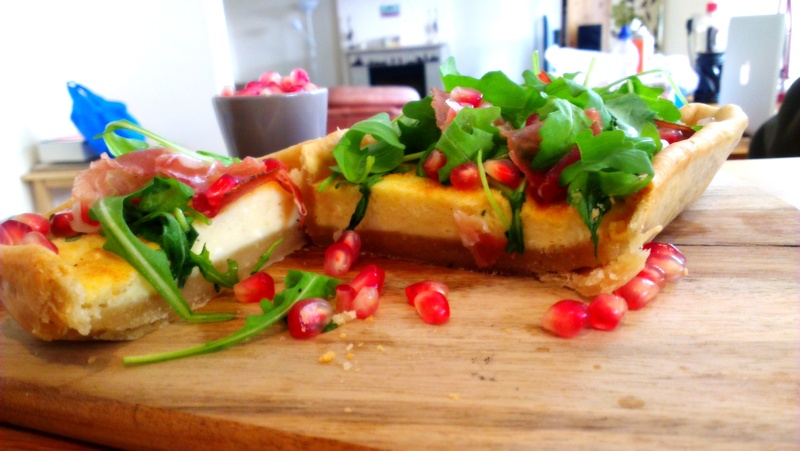 Posted in Guesscipes, Mains, Sides and Snacks, VegetarianTagged goats cheese, guesscipe, healthy, pomegranate, prosciutto, quiche, recipe, sharer, summer, super food, tart, VegetarianBookmark the permalink.